Meet these fascinating primates on this 8 day Best of Uganda Gorillas and Chimpanzees Safari. It is also possible to add a 4 day Chimpanzee safari encounter excursion, which includes Kibale Forest for chimpanzee tracking, and an overnight on Ngamba Island Chimpanzee sanctuary. Arrive in Entebbe, Uganda for your exciting gorilla and chimpanzee safari. On arrival you will be met by your representative and transferred to your hotel in Entebbe. Overnight here for one night on a bed and breakfast basis. Travel this afternoon from Entebbe pier by boat, across Lake Victoria to Ngamba Island Chimpanzee Sanctuary, and view a chimpanzee feeding session close-up from the visitor's platform area. Listen to a talk by sanctuary staff, view a neighbouring fishing village, enjoy some fantastic bird-watching and other wildlife encounters, with the option to swim on the equator, or just sunbathe and relax before returning to Entebbe. Overnight at Lake Victoria Hotel, or similar, on a bed and breakfast basis. Spacious and elegant, the Lake Victoria Hotel nestles in well-manicured, palm-studded gardens. Step over the threshold of Lake Victoria Hotel into an oasis of tranquility in classic colonial style. Each room is equipped with air-conditioning, and the veranda or terrace overlooks the tropical gardens and calm beauty of Lake Victoria.Entebbe is a small town located on the edge of Lake Victoria. Depending on your time of arrival, you may like to spend some time exploring the town on foot, or you can take a taxi to Kampala and visit the craft and curio markets, or the Kasubi Tombs and Museum there. In Entebbe there is the Wildlife Education Centre where you can see close-up the large slow-moving Shoebill Stork, or you can try your hand at golf on the local 9-hole golf course. After breakfast, drive to Lake Mburo National Park (approx. 4 - 5 hour drive). This small park offers a great variety of game including Zebra, Leopard, various antelope and Hippo - as well as prolific birdlife. Here you may go on a walk with a local guide, or on game drives exploring this park. Arrive before lunch. Overnight here for one night inclusive of lunch, dinner, bed and breakfast at Lake Mburo Tented Camp. Game drives and walks are included. Situated high up on a hillside off the main route to the park headquarters is this tented camp with views stretching far and wide. Each tent caters for 2 persons and has its own bathroom area with hot showers provided, eco friendly toilet systems and a private dressing area. A central area provides dining and bar facilities. Meals are generally of a high standard with several courses for most. Today you will travel along from Mburo towards the Kabale region, and then into the mountainous area of the lush Uganda Highlands - the 'Switzerland of Africa' - with great views and vistas of this beautiful green area. From here you will continue to Bwindi Impenetrable Forest, or to Kisoro and on to Ruhengeri, Parc National des Volcans, for your Gorilla Safari tracking base - depending on where pre-purchased permits are held. Overnight at Buhoma Lodge, or similar, on a full board basis. Please Note that overnight may take place in Rwanda. Buhoma Lodge, one of only two located inside Bwindi Impenetrable Forest National Park, is on the edge of the forest offering spectacular views of the forest, and is only a short walk to the starting point for gorilla tracking. Its peaceful location means that you may truly relax after your tracking experience while you listen to the birds and primates in the forest. Each cottage has its own private veranda and is self-contained with a shower, flush toilet and basin. There is a cosy central lounge area for you to unwind around the evening fire, and meals are served in a separate dining room. You will be escorted to the National Parks headquarters after breakfast to meet your guides for the day for your gorilla trekking experience. An early morning trek into the forest on the slopes of the volcanoes, led by experienced trackers will bring you amongst a family of Mountain Gorillas. These massive primates are extremely rare, only approximately 650 remaining. You will get within metres of the Gorilla family, and be privileged to spend time amongst them. Returning to the camp for a late lunch, you will have an opportunity for forest walks with the guides, or just to relax. Overnight at Buhoma lodge or similar. Please note that the Gorilla Safari trekking may be fairly strenuous; up to 6 hours or longer is not uncommon - at relatively high altitude. Mountain Gorillas are wild animals, as such sightings cannot be guaranteed, however the success rate is well over 90%. A second opportunity for Gorilla Safari tracking, with pre-purchased permits subject to availability. For those not trekking, you will have the opportunity to go on a forest walk in Bwindi with a local guide, or on a community walk at the local village which has been included in the tour cost, or perhaps visit the local orphanage. After lunch at your lodge, you will head in a northerly direction to the Ishasha area of Queen Elizabeth National Park, from Bwindi approximately 3 hours drive, to be welcomed to Ishasha Wilderness Camp, or similar, in Queen Elizabeth National Park on a full board basis. Please note: Overnight may take place in Rwanda or Bwindi. This camp is located on a river within the Ishasha sector of Queen Elizabeth National Park. With the backdrop of the Ruwenzori Mountains to the north, and the Virunga volcanoes to the south, there are few places on earth to rival the scenery in this park. Large herds of Elephant, Buffalo, Uganda kob and Topi are often seen, as well as 'tree-climbing' Lions, who favour the big Fig trees. The camp boasts 10 East African 'Meru' Tents, en-suite shower, toilet and basin. Tents are spaced under shady trees, overlooking the river. The dining area is under canvas, on the banks of the river. Activities that can be enjoyed here are game drives, walking with ranger / guide (on request) and birdwatching. Game drives this morning in the Mweya region of the park, enjoy a game drive and a boat cruise on the Kazinga Channel before transferring to Mweya Lodge. Two nights will be spent here game viewing, with an opportunity to go on a Chimp walk at Chamburu Gorge. Located on a peninsula overlooking the Kazinga Channel on one side and with spectacular views towards the Ruwenzori Mountians on the other, this recently upgraded and renovated lodge now provides some of the best accommodation and service facilities in Uganda. Amenities include a swimming pool, the Tembo bar and an elegant air-conditioned restaurant with a global cuisine. Breakfast is taken on the alfresco terrace adjacent to the Kazinga Channel. Morning game drive out of the park, return to Entebbe, via the equator and Kampala, stopping en-route to shop for curios. Additional accommodation can be arranged on request. A half-day or overnight trip to Ngamba Island Chimpanzee Reserve on Lake Victoria can be arranged. 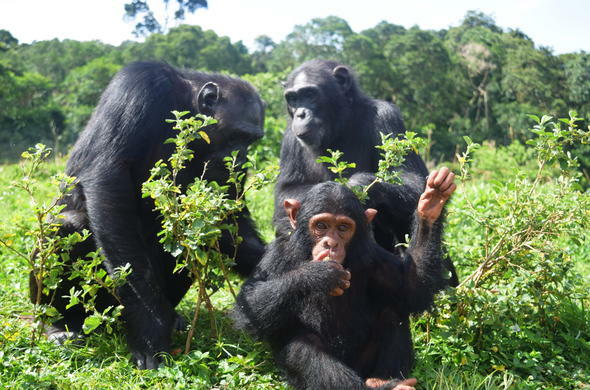 Ngamba is where orphaned Chimpanzees have been relocated under the management of a group of dedicated conservationists including the Jane Goodall Institute. Ngamba Island is part of the Koome group of islands located on Lake Victoria 23km south of Entebbe, Uganda. It consists of approximately 100 acres, 98 of which are forested and separated from the visitor'' area by an electric fence. Ngamba Island was officially opened to visitors in October 1999 and is currently home to 35-orphaned Chimpanzees, 15 of which have been confiscated and brought to the island since it's opening. It provides these orphaned Chimpanzees with a secure home to live out their lives, since a return to their natural habitat is not possible, while educating visitors and local communities about their remarkable species and the importance of conserving their fragile forest habitat.Transfer to the airport for your onward flight, or optional add-ons. If you have a couple of spare days after your Uganda Gorilla and Chimpanzee Safari (either before or after your safari), it is recommended you consider one of the following activities or short safaris. Due to the popularity of Gorilla Tracking, it is important to secure your dates as soon as possible to avoid disappointment, particularly during the peak seasons of June - October, and December - February.